In a recent post I mentioned the 400 hours I’ve spent in airplanes on business trips last year. And that I’m happy for some Holiday downtime. And what did I do? Climbed into the cockpit of an Airbus A320 and took to the air again. Only that I was not really flying. Sounds crazy? Not really. 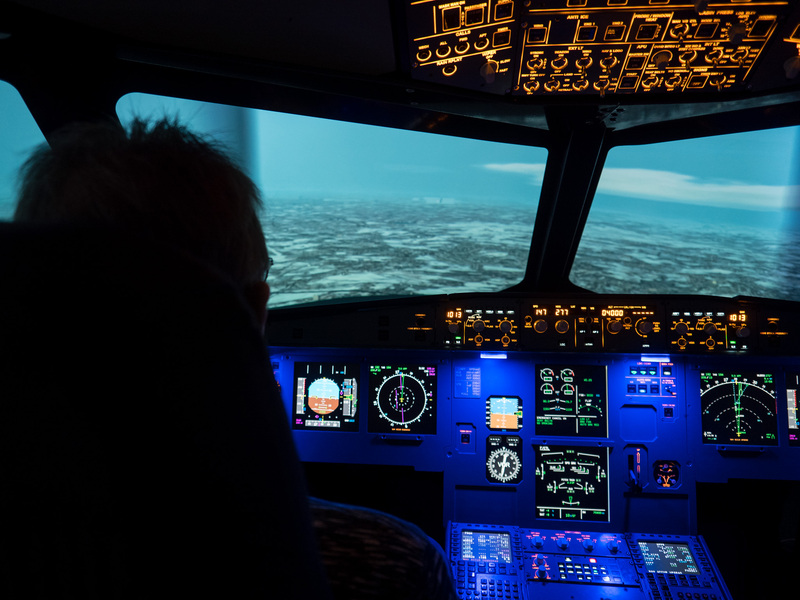 My kids have treated me to 90 minutes in the cockpit of an airliner simulator. 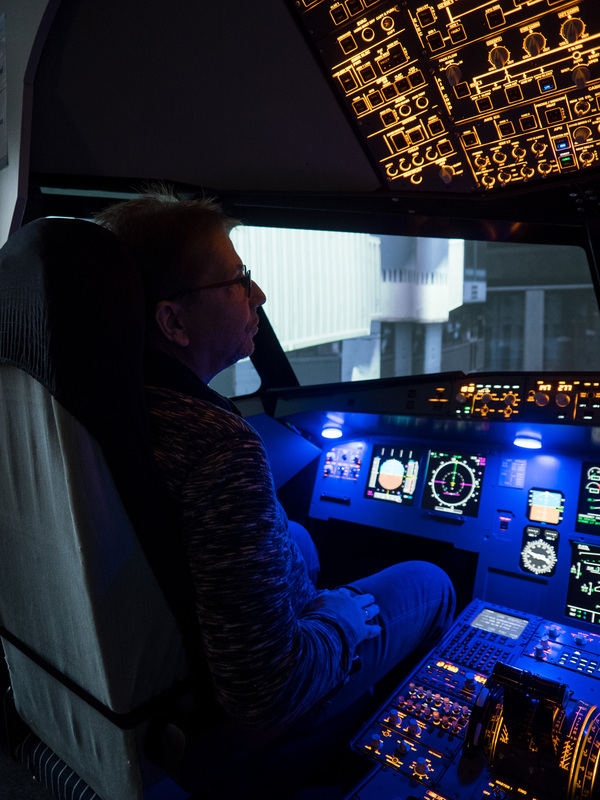 Not one of the real full motion simulators that airlines use for pilot training, but in a detailed cockpit replica with all systems fully simulated. And the near 180 degrees view of the scenery on the screen outside the big cockpit windows was enough to give you the full sensation of flying. I think I’ve written in a previous post that I’ve got a private pilots license many years ago and that I’m a real airplane nut. 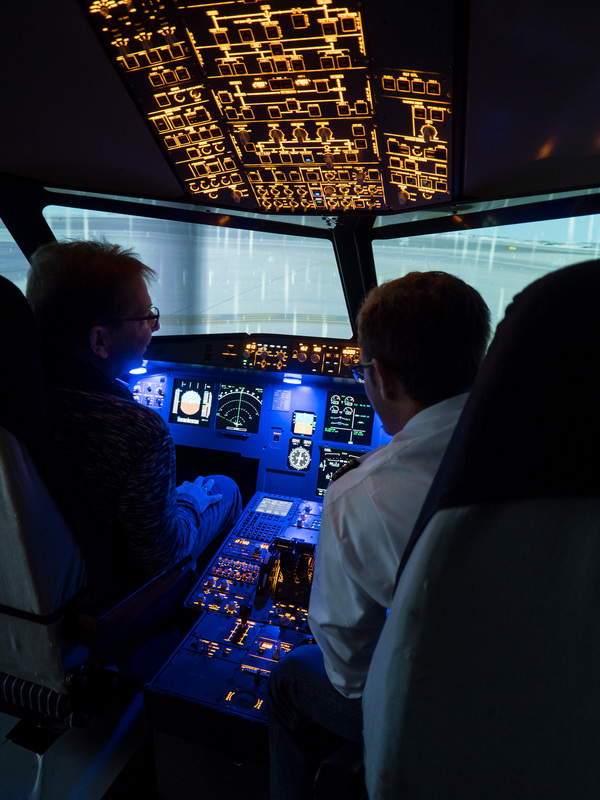 Not only have I logged many hours in Cessnas, but a few years back I also flew an Airbus A340 full motion simulator in a Lufthansa Flight Training Facility. And I landed the big iron just as fine. The basics of flying are the same. regardless if piston engine planes or big passenger jets. So after a short briefing by the flight instructor I did a first takeoff in Frankfurt, flew a pattern and landed successfully on the same runway. Then we did a full flight from Frankfurt to Nuremberg. It was so much fun. All the more, as the kids and the significant other (who took all the photos) where sitting in aircraft chairs behind the cockpit. We landed in snow drizzles about 40 minutes later and docked at the gate. I do fly the Airbus in a simulator on my PC, so operating the systems was quite familiar, but doing it in a real functional cockpit replica was so much fun. A got a certificate for my successful landings. So should ever the need arise in a real flight, that the crew would search for an emergency pilot, I’m definitely ready for it! All photos taken with the Olympus PEN-F with the mZuiko 12mm F/2. Image specs for all are 1/60 sec at f/2 and ISO1600. Well, Marcus that was definitely fun. Congratulations on your certificate. Congratulations 🙂 sounded like a great present!!! Thanks, it definitely was 🙂 ! What a brilliant gift – such a lovely family! Thanks for commenting, Marion. I know I’m truly blessed with my family! This is great! You said ‘so much fun” two times…oh how we need more fun–spread the joy! Brings back many good memories learning to fly in the 1980’s. Nothing beats one’s first solo. 🙂 Take care. What a fab present and experience. Thanks, Arv! It was last year I think that I wrote about it! What a thoughtful and exciting gift! Thanks for commenting 🙂 ! And yes, a great gift by great kids 🙂 ! That’s amazing and what a great gift! These big airplanes are so complicated.